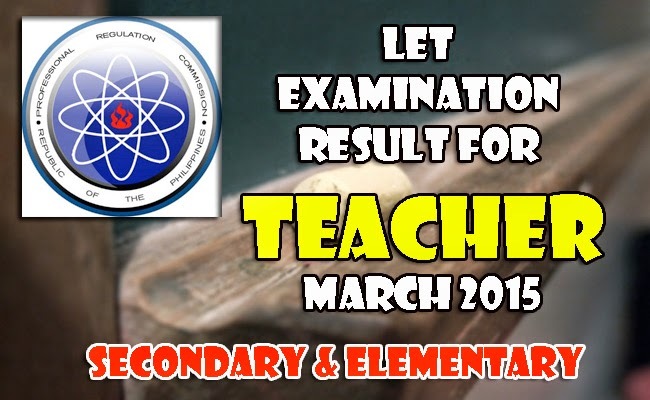 Professional Regulation Commission (PRC), together with Board for Professional Teachers had finally released the result of Licensure Examination for Teachers (L.E.T.) conducted on March 29, 2015. According to PRC, 12,103 had passed the elementary level out of the 44,144 exam takers while 17,904 passed the secondary level out of the 56,596 examinees. Out of the 12,103 who had passed the elementary level, 5,607 are first timers. There are 6,134 repeaters in 17,904 who passed the secondary level. Passers should take oath taking ceremony as it is one of the requirements of PRC for registration and claiming the PRC ID. Check the oath taking schedule in PRC website. Bring the oath form, a cedula, metered stamp, registration fee of 600 pesos and a passport sized ID photo when registering in PRC.